Again, very strong correlation sith SPY. Volatile environment. No real change from yesterday. 60mins: congestion to mildly up. The high volatility environment makes it sometimes difficult to gauge the amplitude of movements if direction and targets are analysed correctly. As anticipated, RUT is aiming at 828 (stronger MM + Fib), now that 812 is passed. MTFS and Entropy are looking good, yet this pattern is not indicative of a strong bull move. Daily: Congestion - trading range. 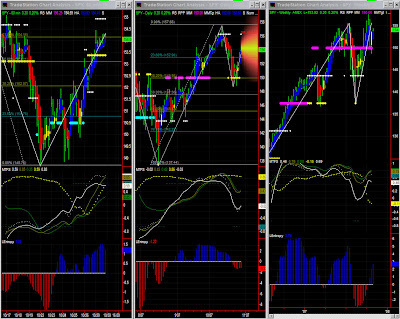 Contrary to lower time frames, the daily chart still points downward, and this is by far the dominant time frame. Caution must be exercised as we seem to have confirmation of a support. Until a new pattern forms clearly, we can assume a trading range [797-828] within a larger one [781-855]. Entropy is looking good, but MTFS indicates continuation of this situation of congestion with a very slight upward bias.We can note that we are again very close to a key level at this time frame with the Swing indicator oscillating frequently. 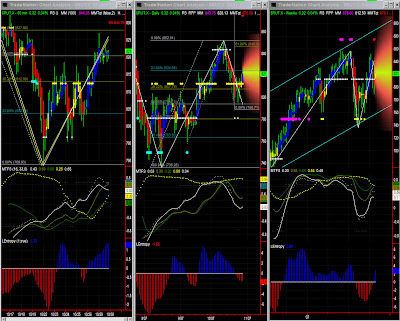 Market direction: Probably up, but check levels and new pattern forming. Note: No significant change from yesterday. SPY reached 153 as expected, and still has some upward potential, so one could well get back to 156. 154.15 is the next Fib level, which should be passed if we consider the strong Entropy and the positive MTFS. Daily: Congestion to mildly up but check levels carefully. Weekly: congestion to mildly UP - Very low significance level. Note: Virually no change from yesterday. NDX is still hovering around stall level, ahead of Fed rate announcement. 60mins: congestion to upward bias. Same situation: The market is both resilient and very volatile. Lower time frames seem to point slightly upward in the same trading range. We reached the high end of that range, which is also bumping on 'stall' level. Since there is still an upward bias, we'll have to watch this level carefully. If this level is passed, NDX will obviously aim for 2250.Note that the MTFS pattern isn't clear, with the white line below the other lines and not even trying to catch up. Entropy is too high to see NDX peaking yet, but we'll have to watch its behaviour carefully (Fed??). Daily: Congestion to Up. Slow down in overbought territory. 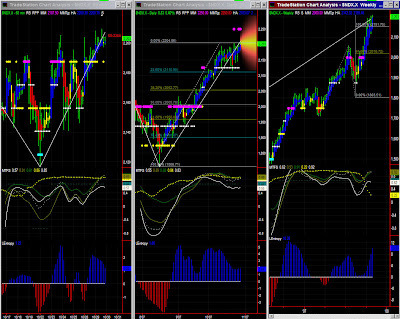 Same situation:NDX is overbought, and each retracement so far has failed. Entropy and MTFS are holding very well, so one may just try and reach 2250 (or stay at prior stall level around current highs). Entropy is looking very good, but MTFS has difficulty adapting to such a strong run (U-shape pattern is not closing). We therefore have 'waves in overbought zone' which may justify looking at a higher time frame. It seems we're entering a period of congestion, at least compared to the seemingly unstoppable bull run we've had. Looking at MTFS, no retracement in sight until it peaks.